Summer means freedom! Finally, a chance for kids to release all that pent-up energy from the school year. Unfortunately, it doesn’t take long for the couch to look a little bit better than some actual fun in the sun. Here are some ways to beat boredom and get kids moving that you might even enjoy. Take a walk around your local park, neighborhood, or even your own backyard! See how many plants, animals, insects, and birds you can identify. Bring a magnifying glass to get a closer look at pretty plants and insects. If you have a child that likes to collect nature souvenirs like rocks, sticks, or flowers, bring a bucket or backpack to fill with treasures. Take the time to explore at your child’s pace. You will be surprised how much learning can happen on a small walk outdoors! 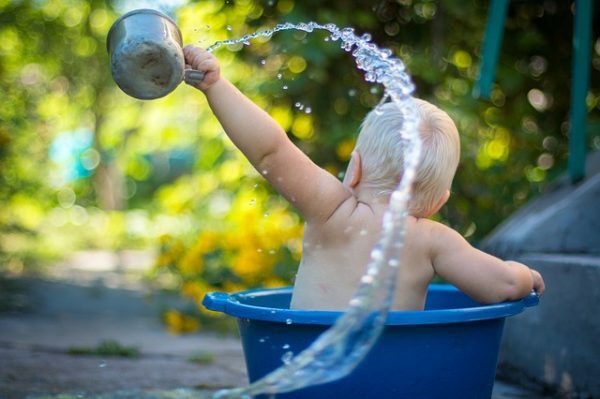 Sprinklers are a great way to get kids moving, occupying them for hours running and jumping back and forth over it. So why not make it a little more interesting? There are so many things laying around your house that you can incorporate into your obstacle course: Kiddie pools, slip in slides, more sprinklers! If you have a trampoline or a plastic play house you can make the course go through, around, or under these! Involve your kids in planning the course and get creative! Classic summer fun. All you need is a few squirt guns and water balloons. Fill up lots of water balloons and store them in large plastic totes or buckets, or even a kiddie pool! Get a large number of kids together (your own or even some neighborhood children) and split everyone into teams. Water Guns versus Water Balloons could be a fun challenge, or even the playing field and give each team a few guns and balloons. Remember to provide proper eye protection to avoid any accidents. Let the fun begin! You can have a Karaoke Dance Party even if you don’t have a Karaoke machine! Youtube has tons of karaoke videos you can sing a long too. Find your kids’ favorite songs and make a playlist. You could even have your own little American Idol competition! If you have any dancers in the family encourage them to choreograph a dance to go along with their song, help them come up with the moves! If you wanted to go all out you could even create a stage with some curtains and pick out fun and crazy costumes to sing in. This activity can be indoor or outdoor, depending on the heat. Getting kids in “quiet mode” can be a bit of a struggle. Yoga is a fun activity that engages children and helps them to slow down their mind and body. There are many yoga videos geared towards child audiences available online. Many of them focus on animals or story telling along with the poses. Explore with your child so you can choose one that you both will enjoy! If you do not have yoga mats just do your practice on a carpeted area or area rug. It can be very slippery on hardwood! You might remember this game from your childhood. The bigger the room the better for this particular game. The rules are simple: The floor is lava, everything else is not! Use pillows or couch cushions to create paths across the room and choose a large piece of furniture to be home base and the out zone. If you step on the floor you get burned and you are out for 10 seconds. One person can play “Lava Monster” and stand or crawl on the floor and try to catch other players. If the lava monster catches you become a lava monster yourself!! With these fun activities up your sleeve you should be able to remedy your little ones’ couch potato syndrome and get kids moving. Remember to have fun and to be creative, none of these games are set in stone! Soon your kids might even be bothering you to get off the couch! Summer activities are fun, but they also can be very messy! Trust the cleaning experts at Modernistic to keep your carpet, upholstery, tile, and hardwood floors looking their best this summer. Click or call today for more info!